CLINTON, N.J. (December 21, 2018) - Unity Bank and its employees have donated a total of $22,800 to 19 food pantries in New Jersey and Lehigh Valley, Pennsylvania. 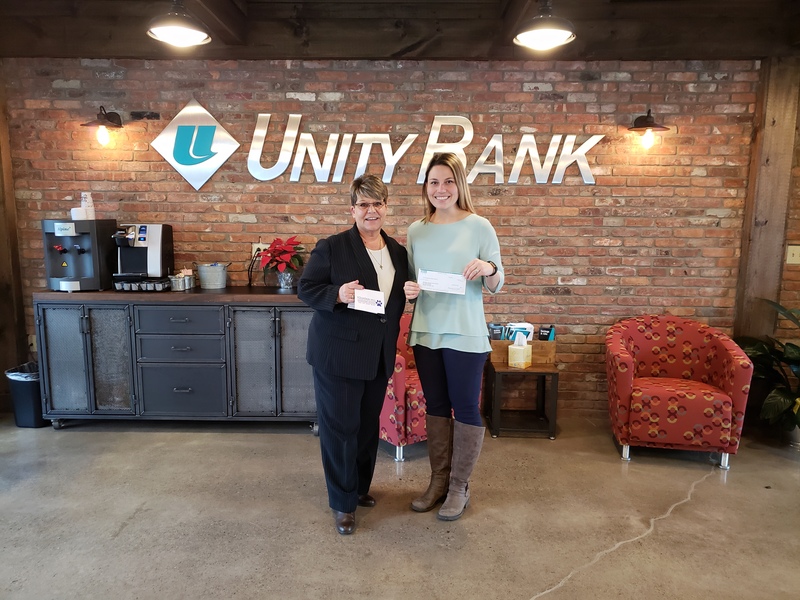 The donation, a record for the fundraiser, were donated by Unity Bank employees and matched by the bank as part of a special holiday community service project. "I am extremely proud of the generosity our employees continue to show in this important community service project," said Unity Bank President & CEO James A. Hughes. "All of these organizations provide vital services to those in need throughout New Jersey and the Lehigh Valley. As a community bank, it is a privilege to be able to support the important work of these food banks." Donations of $1,200 were presented to: FISH Hospitality Program, serving Middlesex, Union, and Somerset Counties, from Middlesex Branch; Flemington Area Food Pantry from Flemington Branch; The Food Bank Network of Somerset County in Bound Brook from North Plainfield Branch; Franklin Township Food Bank from Somerset Branch; Highland Park Community Food Pantry from Highland Park Branch; Home First Interfaith Housing & Family Services of Plainfield from Scotch Plains Branch; Linden Interfaith Network for Community Service from Linden Branch; NORWESCAP Food Bank of Phillipsburg from Phillipsburg Branch; Open Cupboard Food Pantry of Clinton from Clinton Branch; Readington Area Starfish from Whitehouse Branch; St. Paul Food Pantry of Ramsey from the Ramsey Branch; Samaritan Homeless Interim Program of Somerville from Somerville Branch; South Plainfield Social Services Holiday Project from South Plainfield Branch; St. James Food Pantry & Soup Kitchen in Edison from Edison Branch; Union Food Pantry from Union Branch; Helping Hands Food Pantry of Hillsdale from Emerson Branch; Washington Community Food Pantry from Unity's Washington Branch; Community School Food Program for Fountain Hill Elementary School/Northampton Community College from the Bethlehem, Pennsylvania Branch; and Salvation Army Easton Corps Community Center from Forks Township, Pennsylvania Branch.